The NRA will launch the National Retail Association Sustainability Committee in February this year to bring together sustainability experts from across the retail industry to share, discuss and advance developments impacting our environment and consumer opinion. The NRA has a long history of offering retailers an opportunity to come together in competitively-neutral forums to share, discuss and advance developments across the industry. The NRA’s current industry committees include the NRA Technical Standards Committee which has been at the forefront of product safety initiatives for the past 10 years, and multiple state-based NRA Loss Prevention & Crime Committees which have created dialogues between key law enforcement bodies and the retail industry. understand and manage the ways in which the retail industry impacts upon the community and environment. The Committee’s forum will also provide key industry stakeholders an opportunity to network and share information with like-minded professionals in their field. 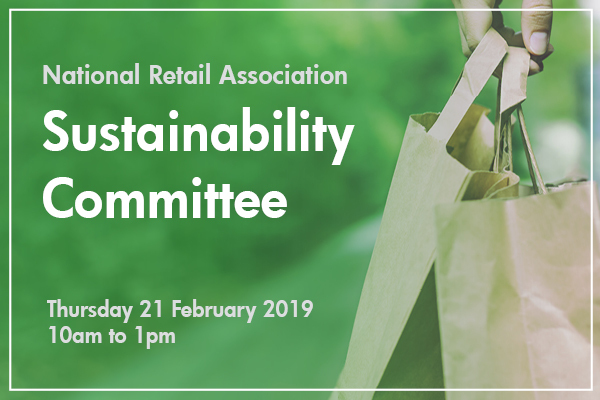 The inaugural meeting of the National Retail Association Sustainability Committee will be held in Melbourne on Thursday 21 February 2019. Interested retailers are encouraged to contact David Stout, Manager Policy, at d.stout@nra.net.au or call 0409 926 066.